Is Hadleigh 4000 Years Old? An archaeological dig by the Suffolk County Council Archaeology unit over the last six weeks, financed by Persimmon Homes, has been unearthing some interesting findings. The Hadleigh Society has been in regular contact with the Archae­ologist supervising the site adjoining Boswell Lane. Aerial photography had identified two circular features, which have now been confirmed as Bronze Age burial sites. They contained a number of Cremation Urns including two large ones (about 15” in diameter) buried upside down with bones under them. Although not yet scientifically dated these urns are thought to be Early Bronze Age and between 3,500 and 4,000 years old. Graves of four Saxon burials have also been found, which judging from their alignment are three pagan burials and one Christian. Some artefacts were found in the graves and have all been removed to Bury St. Edmunds for identification and conservation. We hope to have photographs of them in the near future. In the corner of the site near the Buyright entrance a number of post holes have been excavated indicating medieval buildings. It is not clear what the purpose of the buildings was since the only related artefacts found near them are broken Ipswich pottery in a pit. Once the “dig” is completed the site will be developed, for housing and to provide additional car parking for the Buyright site. By then all the “finds” will have been removed and everything will have been accurately plotted and photographed. It is only when all this information has been carefully analysed that a true picture of the history of the site will emerge, which may well take a year or more. We will wait with interest for the detailed report, but there does already seem to be evidence that people have lived in what we now call Hadleigh for at least 3,000 to 4,000 Years. After all the activity leading up to the Babergh Development Committee’s rejection of the Tesco application and provisional approval of the Buyright application, the following weeks were very quiet. The Government Office had three weeks to decide whether to call the Buyright application in for determination by the Secretary of State. On the last day they issued a notice extending that period to give them more time for consideration. Tesco then announced that they would be appealing against the Council’s decision. Tesco are also threatening to ask for a judicial review against the Buyright approval. So, the fight goes on. Buyright may still get approval, in which case we do not think that the judicial review will be a serious threat. If the application is called in then the consequent inquiry will most likely deal with both applications together. As soon as we know it is necessary we will start an appeal to raise money to continue our fight against Tesco, to pay for professional advice and, if necessary, legal representation. Judging by their accounts at the development committee meeting, the single most striking influence on their decision was the site visit, when they came to see just what an impact the Tesco buildings would have on the environment of Sun Court. The many words in Tesco’s documents could give no impression of what it would be like, and their pictures were very selective in the views they showed. Not being able to organise an articulated vehicle, let alone erect a building for the visit, John Bloomfield did what any good architect would do for a major project. 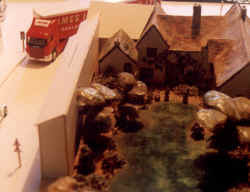 Arranged around a pottery scale model of Sun Court he built models from Tesco’s plans. You can see the effect here. In particular it brings out the forbidding effect of the huge rear wall of the building that flanks the entrance. It also illustrates the challenge of driving an HGV in and out, a point that was corroborated by the HGV professional on the committee. Anyone recently passing along Angel Street towards Lady Lane will have noticed the building activity at the corner of Aldham Road and the bus stop layby in Lady Lane. This site, once part of Place Farm, but popularly locally known as The Monastery, is full of legends and mysteries. Until recent years, just into Aldham Road was the Monastery Garage and Monastery Stores, demolished in 1995 and now all built upon. No documentary evidence for a religious establishment exists, except from a Latin translation of the will of Aethelfleda of 991 which referred to a monastery at Hadleigh, and quoted in Dugdale’s ‘Monasticon Anglicanum’ of 1846. A local story also persists of a tunnel from this site to St. Mary’s Church, and the road name of Lady Lane adds to the possible speculation of nuns. A few hard facts can be determined however as this was once a site of some significance. Until the early 1930s (even this exact date is not known) a fine late 16th century brick gatehouse, a brick barn and a boundary wall existed, extending from Lady Lane and into Aldham Road. 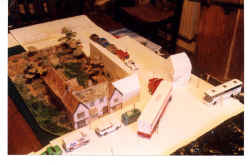 At this time it was all demolished, except for the short stretch including the base of the barn just past the bus lay-by, which can still be seen today. Even this short remaining fragment shows good quality and partly diapered early brickwork, and also an indication of the not inconsiderable height of the boundary wall. Something must have needed this scale of protection or enclosure, but all that is known is from a 19th century sketch of a dilapidated modest timber framed structure, once within the walls. The mystery deepens with an early 20th century postcard view of the gatehouse and the barn, with the inscription stating ‘old Roman Church, Hadleigh’. This can be dismissed immediately but how anyone could apply this description just adds to the overall mystery of the site. Back to some facts: Joseph Hodskinson’s Suffolk map of 1783, names only three places in Hadleigh viz: Benton End, Pond Hall and Hadleigh Place. The 1839 Hadleigh Tithe Map and its apportionment tells us that Robert Bower was the owner of Place Farm, which was of some 49 acres. Two of the field names were Little and Great Duffet’s Hill, and there is a hill up towards the present Hadleigh Bypass. 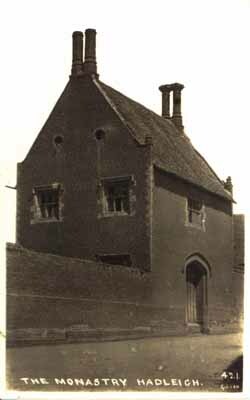 The derivation of the name Duffet’s is land containing a dovecote or dovehouse. Hadleigh Place, and a dovecote, therefore indicates something in keeping with the substantial boundary wall and a fine strong two storey gatehouse. There were once two ponds, and it is quite likely that one of them was created by the clay that was dug out to make the bricks on-site for the building works. This was a common practice at the time when the gatehouse, boundary wall, and the residence (?) within, was built, sometime during the 16th century. Did the site have an earlier history before this date? In 1582 Edward Clarke was recorded as receiving a yearly rent charge out of Place farm so this seems quite likely. Therefore in conclusion, what was this site; was it possibly originally the site of one of Hadleigh’s five manors, Hadleyes in Hadleye, sometimes known as Mausers? Or is the writer just adding to the mystery surrounding this site? Now new buildings are growing over the former Place Farm, and part of the site is now moving into a new era. Sue Angland joined the Executive Committee of the Hadleigh Society as Honorary Treasurer nearly three years ago, only shortly after arriving in the town from Colchester. She was born and raised in Essex. Having attended Teacher Training College in Kent, she began her career in Brentwood, teaching Mathematics and European Studies. 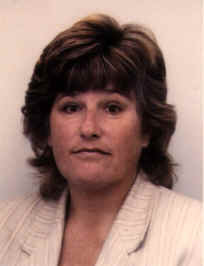 From there she moved to Colchester to work primarily in junior schools with special responsibility for Mathematics. For most of her teaching career she was an active member of the National Union of Teachers. Sue left the teaching profession after twenty years’ service and was then able to devote more time to her many interests including genealogy and travelling. She has traced one side of her family back to the early 18th century and discovered that one branch of the family tree originates in Stoke-by-Clare, so she does have a little Suffolk blood! When Sue moved to Hadleigh one of her first tasks was to visit the Hadleigh Archive in order to research the history of her cottage in Benton Street. She soon became a volunteer ‘archivist’ and an active member of the Hadleigh Society History Group. Throughout last summer she organised the delicious cream teas in the Guildhall garden, and has been known to give the occasional guided tour. Sue has been so busy becoming an enthusiastic expert on the history of Hadleigh and making many new friends that she still knows very little of her own cottage’s past! Hadleigh has a few claims to national importance but the earliest was as the burial place of Guthrum. To many current residents he may only be a road name but to the Anglo-Saxon chroniclers he was a major figure of his time. On 16th March Sue Andrews drew on what records now exist to bring him to life in our imagination. The story was told as two chapters. The first chapter began with the arrival in 871 of Guthrum and his “Summer Army” of Vikings. This was just a year after the martyrdom of St Edmund. They had the grand ambition of conquering all of England, and Guthrum for his part wanted South Umbria, south of the Humber. This campaign was extensively recorded, albeit from a West Saxon perspective, with the Danes having the upper hand initially, but with Alfred rallying his forces sufficiently to achieve a settlement of equals in 878. By this stage the Danes were only too pleased to give up war and settle down as farmers and traders. Alfred became friend and neighbour and sponsored Guthrum’s conversion. Under his Christian name of Athelstan the Dane settled and ruled East Anglia. The second chapter brought us closer to home, but with much weaker documentary evidence. Place names known as ‘Grimston Hybrids’ indicate where Danes took over Saxon settlements and renamed them with their own names whilst retaining the Saxon ‘-ton’ suffix. Kettlebaston, Flowton and Bildeston show strong evidence of local Danish/Saxon coexistence. Hadleigh retains the old form but with varying interpretations. The Reverend Pigot, our Victorian historian, claimed that it meant Chief Place, as Guthrum’s seat. It is difficult to find many documents that make any association between Guthrum and Hadleigh, and when we look closely at the origins we find the closest was written 100 years later, although most likely with reference to earlier manuscripts now lost. It is from this that we learn that Guthrum was buried in Hadleigh in 890. It is believed there was a church in Hadleigh from the 10th century and from 1767 through the 19th century to 1984 archaeological excavations have uncovered signs that might be traced to Guthrum. A tomb in the South Aisle of St Mary’s church has been attributed to Guthrum, with excavations finding signs of an earlier building beneath it. The latest dig in 1984 discovered ancient foundations and Saxon pottery just as it ran out of time. Most recently, Jane Haylock reported that a dowser has traced the layout of the foundations. Whilst we cannot conclusively claim Hadleigh to be the last resting place of Guthrum , no other place has made any counter claim. Sue concluded her talk by pointing out that Alfred has a statue in Winchester. What about Guthrum? On Tuesday 25th April 2000, usual place, usual time, Mrs Pat Lewis will be revealing some of the local history of the movement. As usual, the Hadleigh Society will have a display at the May Show which will be on Saturday 20th May in Holbecks Park. If you would like to help then please get in touch with a member of the Executive Committee. We look forward to the opportunity to meet our present members and to enrol new ones. Nominations were invited last month for the award, considered annually, for 'Outstanding improvements to, or conservation of, Hadleigh's buildings or environment'. By the deadline of 1st April 2000 no valid nominations had been received. From time to time we get membership enquiries from overseas, via the Internet. Last year the Executive Committee agreed to grant an Internet class of membership, subject to ratification at the forthcoming AGM. We make no charge to these members because we incur no costs. We notify them by e-mail of each new issue of the newsletter, which they read on our Website. They are not entitled to free entry to meetings: we don’t yet provide those via the Web!